The world of science fiction has long been a porthole into the realities of tomorrow blurring the line between life and art. 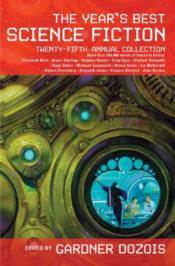 Now, in "The Year's Best Science Fiction Twenty-Fifth Annual Collection" the very best SF authors explore ideas of a new world.This venerable collection brings together award winning authors and masters of the field such as Robert Silverberg, ian McDonald, Stephen Baxter, Michael Swanwick, Paolo Bacigalupi, Kage Baker, Elizabeth Bear, Alastair Reynolds, and Greg Egan. And with an extensive must read anthology for all science fiction fans and readers interested in breaking into the genre.